Identical twins were spotted apparently jockeying for position in their mother’s womb, according to reports on April 15. The video of the twin sisters was shot somewhere in China, showing them apparently kicking and hitting one another during an ultrasound scan. The mother was four months pregnant, the Daily Mail reported. The father of the twins, identified as Mr. Tao, said he filmed the ultrasound scan, saying they were “boxing with each other for a few rounds.” It was uploaded to a social media app before it went viral. The Mail quoted Tao as saying that the twins shared the same amniotic sac, noting that it’s known as monochorionic monoamniotic twins, or Mo-Mo twins, which is a high-risk pregnancy. There is about a 50 percent chance the babies will survive after 26 weeks, the Mail noted. The report said that the twins were born without any incident. 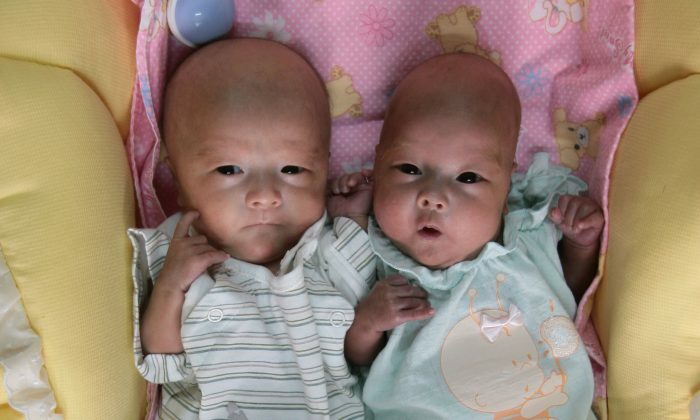 TwinsUK noted that monochorionic monoamniotic twins, while “quite rare,” typically “require special care and monitoring. Monoamniotic triplets can also develop.” Health concerns include umbilical cord entanglement, cord compression, premature birth, and “twin-to-twin transfusion syndrome,” which means “one twin receives the majority of the nourishment in the womb” while leaving the other twin malnourished. Starting in the late 1970s, the Chinese regime implemented its “one-child policy,” which many experts have described as disastrous. The policy led to numerous forced abortions or the state confiscation of children. According to NPR, citing the Women’s Rights Without Frontiers, forced abortions are still carried out despite the Chinese Communist Party (CCP) announcing that the one-child policy would be relaxed. In December, the regime coerced an ethnic Kazakh woman with two children to come back to China’s Xinjiang Province, where they forcefully aborted her third child. She already had two children. In the dead of night, she said, CCP officials arrived at her house and took her to a hospital. After a scan, they said she was several weeks pregnant, which she apparently didn’t realize. The hospital then aborted her child. The authorities told that her a third child wasn’t permitted. They then threatened her, saying that her brother would be sent to a camp. After the procedure, she said, “I was staying in the solitary ward. There was a camera facing my door. They wouldn’t let me see my children.” Then, they tried to force her to memorize Chinese communist propaganda. “China should have stopped the policy 28 years ago. Now it’s too late,” says Yi Fuxian, a senior scientist at the University of Wisconsin in Madison, told The Guardian. According to the Guardian in a March 2019 report, by 2050, about a third of China’s population will be made up of people over the age of 60. The report said it will place a burden on families and state services, which may be irrecuperable.